In this self-harming nation series of essays I had tried to bring out to the people of Pakistan that our country is heading to. Actually, we have reached back to the pinnacle of negativity. Our morally straight military leaders’, corrupt politicians’ spineless bureaucrats have sold their soul to either the un-Islamic clerics or the medieval male chauvinistic leaders in the society. Our leaders have been obsessed with Kashmir (https://www.viewpoint.net.in/pakistan-self-harming-nation-6/) as if it is a Holy grail of all our problems in Pakistan. Pakistan projects itself as a peaceful nation. It may be peaceful but what about our army firing at Kashmiri civilians. In Kashmir, it is said more blood is being spilled due to our shelling rather than Indian army atrocities. Like in 1970’s we have alienated our Baluch brothers but want to help Kashmiris. I do not understand where in Islam is it written that spreading disorder in another country is Islamic. Our leaders have been doing un-Islamic activities due to which we as people are experiencing the wrath of Allah. We portray that we are Islamic and do not fear to be truthful however the same is not true on the ground. Our leaders have been spreading lies killing each other and spreading rumors. We in Pakistan do not respect our women. There instances where daughters are killed inside their houses by electrocution. In most cases, these never reported as they are honor killings. Mostly the killings are due to suspicion about being in an affair with another boy. We have religious clerics who pass dictates that women of a state in Pakistan are war booty and public property. We have a history of disrespecting our mothers, sisters, and daughters. Women expect protection from their families relatives and friends. If they do not get it where will they go? This is the question we have to ask everyone. We are an Islamic country and look at sharia for solving our issues. We have been promoting the same in other countries. The ISIS today has been promoting the sharia to letter and spirit. They have been brutally beheading and killing innocent men, women, and children in the name of sharia. These innocent victims were in cases were never involved in any kind of crimes in their entire life. They had never harmed anyone and in some cases were even Muslims. This promotion of sharia blindly without some modifications as per the times will hinder our countries growth. In the international sphere, if we follow sharia it doesn’t concern others, but when we see ISIS killing in the name of Sharia then people will see us with concerns. It would be better for our clerics to keep quiet and follow practices but not create noise. We have to learn to behave and change with time which these clerics are not ready to do and this is making lives of people of Pakistan miserable in near future. Pakistan is already listed into the Grey-list, shortly we are going to see Pakistan in Black-list. Of late it has been seen that ISIS has been raising its head in Pakistan through its reverse route i.e. from Kashmir. The Indian government is totally unreliable when we say that they will be able to contain ISIS. As on date after every Friday prayer, the Kashmiri youth come out on streets with ISIS flags. Recently after killing of Burhan Wani Zakir, Musa took over. He immediately switched his loyalties from Pakistan to ISIS. So the entire obsession and effort of ISI to gain control of Pakistan will shortly go down the drain as was with ISIS is a completely different ball game. Now the people of Pakistan will have to choose between Kashmiriyat and Sharia. As a self-harming nation, we have to decide we will go ahead with our failing Kashmir policy and freely invite the ISIS radicals or stop all the militant camps. 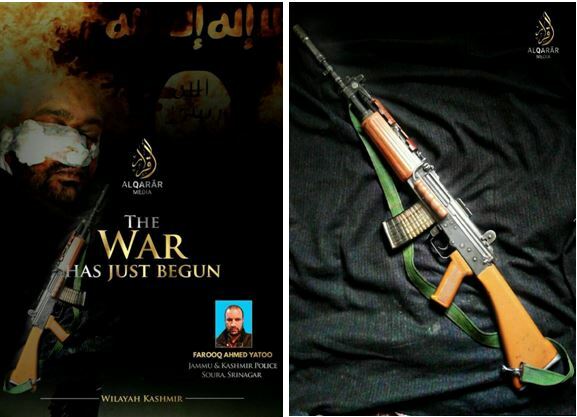 The recent images have given out by ISIS it claimed that they have killed J&K Police jawan Farooq Ahmed Yatoo in Srinagar. It is second such claim in the last six months. This is giving a clear indication that ISIS is influencing the Kashmiri youth. This will also influence the Mujahidin sent by ISI. Once they return they will bring with them the ISIS ideology. These Mujahidin will be out of the control of their old ISIS master and will start taking over the control of militant camps. This will surely make us a self-harming nation. Recently we have been listed into the grey-list by FTFA in Paris. Our long-standing friend China did not hold on to our hand. Our ally Saudi’s dropped support to us when Americans threatened them. This is ditching Muslims by another Muslim in the hour of trouble. Turkey also did not hold on to the American and British diplomatic attack. Now we are at the brink of a balance of payment crisis. If that happens we will have to go back to IMF and other international banks seeking loans at larger interest rates. The general elections are around the corner; I cannot dictate the people of Pakistan whom to vote. I can just say that let’s not vote for spineless people who cannot stand for the people of Pakistan and their well-being. Let’s prove to the world that we are not a self-harming nation that is going to go down the lane of history as a nation that could not make its mark.